This entry was posted on Tuesday, August 5th, 2014 at 10:53 am	and is filed under Round2 Models. You can follow any responses to this entry through the RSS 2.0 feed. You can skip to the end and leave a response. Pinging is currently not allowed. 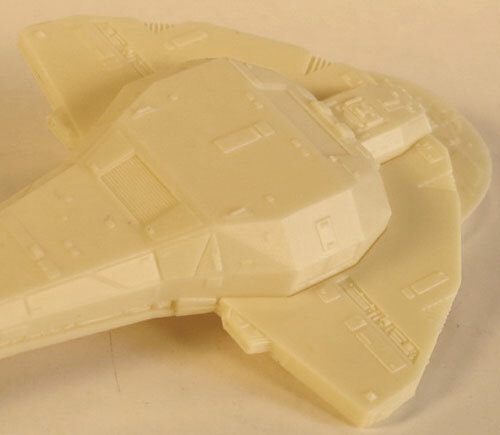 Will the Saratoga be a new tool or a repurposed Reliant from the TMP kit? I assume the DS9 Defiant will be reused as well. The parts for the Saratoga were tooled along with the Reliant when we did that one. The Defiant is the same model we’ve issued in our DS9 kit, but we’re adding decal wraps as we usually do in our Cadet kits. Will there be a 1/1000 scale Saratoga counterpart? I’m certainly looking forward to one! what is with parts to build a Celdon class ship? Um… I’m not sure I understand your question. I believe he’s referring to the Keldon Class Cardassian ship. A variation of the Galor class. How bout the cadet USS Enterprise NCC-1701-D three warp engines and 1400 scale USS Titan NCC-80102 starship. The Dreadnought Enterprise-D might be a possibility some day. 1400 scale USS Prometheus starship and USS Centar starship. USS Excelsior and USS Baker and USS Titan starships. But, no matter how many times you mention them, the odds of them coming out won’t improve. Any idea of whether (or when) Star Trek Voyager will get a Cadet Series treatment? I can answer more about the “whether”… Yes, it is a ship I’ve had near the top of my to-do list for some time. That said, we don’t have it on our plan for the near future. for 2500 scale how about 1000 scale ship. That would be cool too. I like these ships bigger. kits to come out I love them. We don’t plan on bringing that one back out (I assume you mean the 1/537 scale Refit). Most modelers don’t like the inaccurate surface texture. We took a look at fixing that some time ago, but we found that the kit would need to be nearly completely retooled to do so. 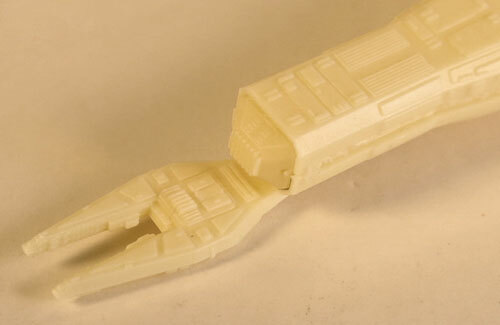 Does this mean that you guys will not consider bringing out new-tool kits of both the TOS and Refit Enterprises in a scale that would make the finished models bigger the the original AMT kits, but smaller then the 1/350 kits (due to cost)? I’m thinking somewhere in the 22″-24″ range which would be great for people who don’t have the space for the larger kits. Also, are there any plans to release other 1/350 kits? I can see the appeal in kit sin those sizes, we tend to stick to the “common” scales (1/2500, 1/1000, 1/350) when considering new kits. I’ll never rule anything out though. 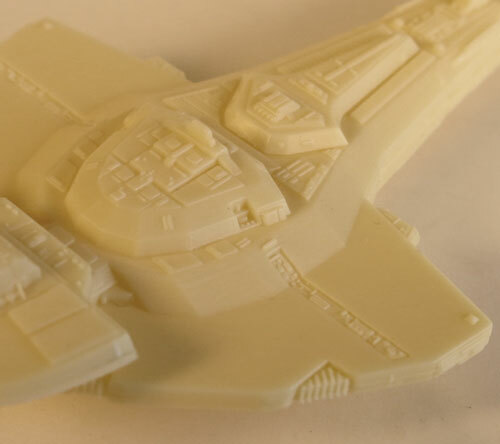 Klingon Vor’cha-class attack cruiser all 1/2500 scale. Jamie – Any idea when Diamond Distribution will get the 1/1,000 Reliant to local comic book stores? I pre-ordered one months ago, and I am surprised that the Reliant has been available for over a month now by other channels, but not via Diamond. Thanks for making new Star Trek kits! Like many others, I would love to see a Search for Spock set of the Excelsior, Grissom, and KBOP as your next 1/2500 three set. I really have no clue on that. I have to think they would have received their shipment when the kits first came in. Did you ask someone at the store about it? They should be able to check and see when it will be in. But comic shop owners have no way of knowing when Diamond will ship models, toys, etc. Merchandise is solicited 3 months in advance of release, but actual shipping dates are bizarre mysteries. I received the TOS Romulan ship via my comic store before anybody on the internet got one. Conversely, the Vulcan Shuttle came out about 2 months after hobby stores received theirs. Diamond is a lousy distributor for goods other than comics, but they are pretty much my only option in a city without a model store. Anyways, I was just checking to make sure it wasn’t a situation of your warehouse being sold out or something like that. My LCS can usually check for me if a certain comic is coming or is currently available. I would think they could get the same info on everything else, but I’ve never had them check on other products. I heard earlier today that we are running low enough on our warehouse stock that we’ll be triggering a second production run soon. Yes, all are being/have been considered. No plans currently, but these all present strong possibilities. Glad to hear these ideas are strong possibilities. I’ll keep my fingers crossed! and USS Grissom too in 1\1000 scale and 1\2500 scale kits. Slightly off topic, but is there any update on the 1/1000 Sulaco, from Aliens? Hope to have an update soon. Any chance of an update on the Star Trek Galileo? Thank You guys for bring out these model kits. I too like to see USS Sulaco model kit to come back out soon I miss the model the last time. USS Kilven 2009 models think about it in the next set. come out and the rapter shuttle craft too come out from the new Battlestar Galactica kits soon is that is impossible to do. 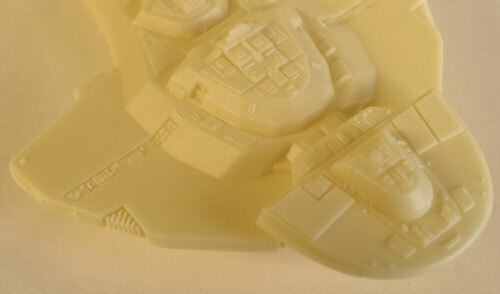 It is impossible for us to do in that we do not currently have the BSG license. This is off topic, but since you guys own the MPC molds, are there any plans to reissue the Disney Haunted Mansion/Pirates of the Caribbean kits? There seems to be a lot of interest in these kits and, if you can find them, ebay prices are through the roof. We’ve looked into it, but releasing them is a tricky (in some ways difficult) matter on several levels. I’m guessing that includes all Disney properties. Was going to ask about “Black Hole” models. 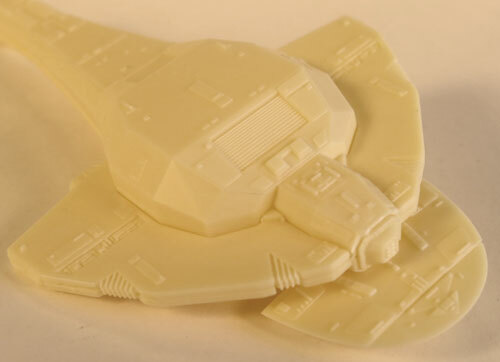 Would love to see a Cygnus molded in clear plastic. Yeah, we would run them all if we could. impulse engine deck two ways to make it. David, unfortunately that’s not an option for Round 2 and their brands, since they don’t have the license for the new Trek movies. Actually, the Hindenburg, as well as ships like the Akron and Macon, are more accurately classified as “rigid airships”. A rigid airship has a metal frame into which gas bags are placed and are covered with a skin stretched over the frame which is why you see those longitudinal ribs. “Zeppelin” is also technically incorrect but accepted for RIGID airships but was actually a brand (the Zeppelin company) named after the man of the same name… kinda like we call all facial tissues as “Kleenex” even if they are produced by a different company that cannot use the name. “Blimps” are actually the name given to non-rigid airships like the Goodyear and Fuji blimps. These airships have no skeleton and the shape of the envelope is maintained by the pressure of the lifting gas (helium) and the adjustable ballonets inside. it would be cool to have for the first time for a model kit USS Enterprise NCC-1701-D cut-way ship showing deck by deck of the ship and USS Enterprise NCC-1701-A movie model kits. do you think that’s impossible to do?. Some good contenders there, but more Cadet kits will be a ways off. 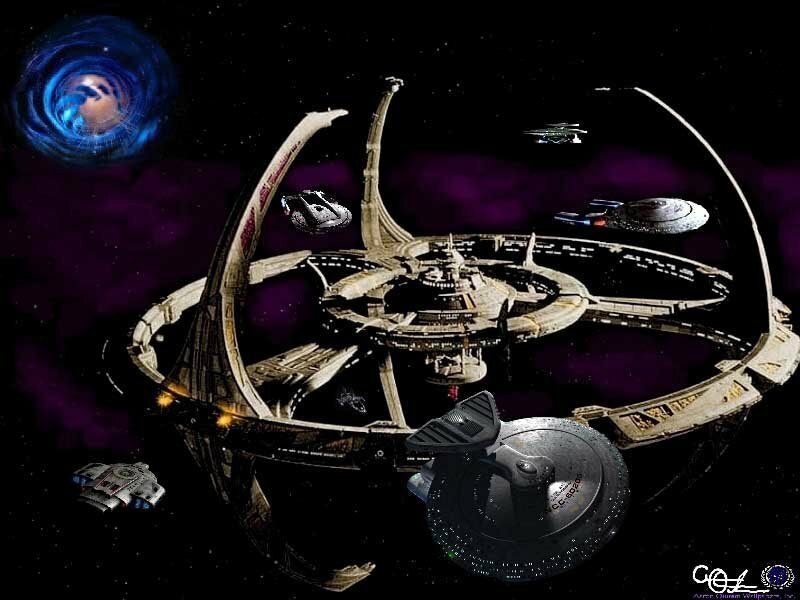 I agree that a Star Trek#3 movie series would be a nice offering, but I would love to see the USS Excelsior and the USS GRISSOM in 1/1000 scale for sure! out or not in 1/1000 scale model kit. I like to see it to come out. No plans for that one right now. or will it come out soon in 1/1000 scale or not that will be cool too. No plans to do a 1/1000 version at the moment. There was a little bit of news at iHobby that R2 will be selling the Cadet ships individually, and pre-painted/decaled. Can we expect that everything in the existing Cadet 3-packs will be in this new line? Any idea when they will hit shelves, or MSRP? Details on that will come soon. Now the Kardashians are getting thier own model kit?!? What on earth do we have to do to stop this family!? They’re just famous because…what? Oh really? 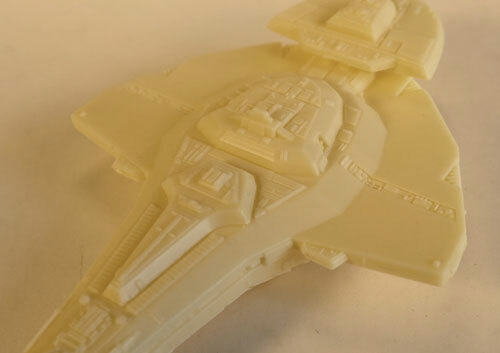 Apparrently this blog is about a model SPACESHIP, not a family of untalented rich people. My bad…continue. On the serious side, I know very little about this particular ship, but I know what I like! From what I see above it’s shaping up nicely. another model kits keep up good work. When you bring out Aliens model kits next year I hope. I’m happy to announce that XO Kane will be coming out this Spring! I have recently reviewed test shots and they are 99% of the quality of the prototype we have been showing. A buildup is underway and I’ll be sure to pass along pics of that as soon as it is done. Has there been any updates done to the upcoming reissue of the Cut-Away Enterprise to make it more accurate, besides an updated decal sheet? Can’t say much at the moment as we are currently working out the details for that release. Any chance we will see the Galileo before Christmas? It would make a great gift! I just saw the first look articles up at Allscaletrek and Cybermodeler – The DS9 Cadet Kit looks great! I’m excited about picking it up! Is there any chance of an update? It’s been a while since the last posting here. 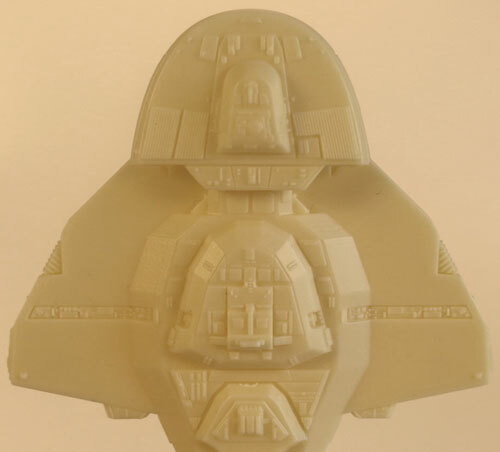 I’d love to hear whether Round 2 is considering any more Cadet Series kits; What’s happening with the Romulan Bird of Prey; and what the latest is on the Alien/Aliens 1/1000 Sulaco. Sorry about the gaps in posts. I hope to get something up today about the RBoP. We’ll always consider doing more Cadet kits, but none are on the horizon at the moment. Here’s a thought – How about an Alien/Aliens Cadet Series kit with the Nostromo, Sulaco, and the crashed derelict from Alien. All in 1/2500 scale. Those would be great to see, and would go well with the released Trek ships! Jamie – BTW, further to my post on Sept 10, Diamond released the 1/1000 Reliant kit to comic stores yesterday, November 19. No idea why that took so incredibly long. 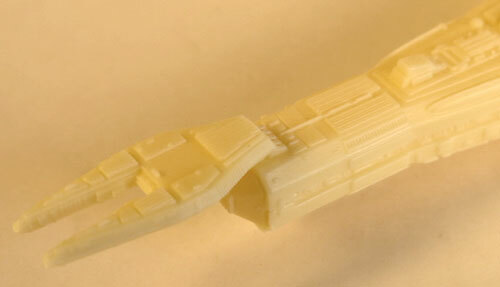 Any idea which quarter we will see the Space:1999 lab pod Eagle? Please please please do a 22 inch Eagle at some point! The Deluxe Eagle will be out right around the turn of the new year. It may be here by Christmas, but I’m not in a position to make that a promise. that will be cool about RBOP for the Cadet kits come out soon next year about Klingon D7A movie for the cadet kits that will be cool. I have written at least 100 requests to round 2, over the last year. I would like a update of the shuttle craft model kit. I don’t care about the date, but I would like a answer. polar lights seems incapable of answering that. how about something easier, I asked about a personnel kit for the new bridge kit something in the order of about 10 people. a security guard for the turbo lift doors, a few tech in tech jump suits, a few more people to man the eight plus stations manned during red alert on the bridge. and maybe even a F-104 pilot in orange flight suit, or a romulan commander. We don’t have an update to provide about the Galileo right now. I hope to have something soon (as in by Wonderfest). We have no plans to do additional crew figures on their own right now, but your suggestion has been noted. I appreciate your persistence, and thanks for your suggestions. I am hoping that Round2 Models in the coming years will expand their Star Trek kits series with a wider variety of subjects from the various television franchises, so far they have done an excellent job bringing collector’s the core subjects but I am hoping they will go deeper perhaps some iconic character figure kits like Khan from Star Trek WOK or Admiral Kirk from Star Trek TMP Heroes and Villians, that sort of thing, also in 1/1000 scale I think a accurate U.S.S. Excelsior is in order, as well as the Klingon Bird of Prey. So please take another look at those unsung heroes Round 2 Models.